A truly valuable mission is currently taking place in Norway, in the sea between Bodø and the Norwegian continental shelf break. Three unmanned vessels, including a SailBuoy, a WaveGlider, and one diving Seaglider produced by Kongsberg Maritime, have been sent out on a six-month autonomous mission in an effort to increase our knowledge of the marine ecosystem and hopefully reveal some secrets of the ocean. Steered remotely through satellite link by operators on shore, the autonomous vessels face true challenges in a demanding environment often with strong and unpredictable currents and rough weather. This kind of experiment requires close collaboration between operators, project coordinator and scientists for all mission aspects, such as planning, deployment, piloting and recovery. 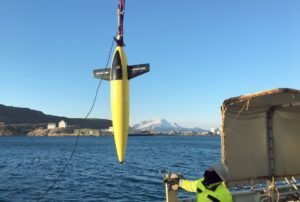 The mission is part of the project “GLIDER — Unmanned Ocean Exploration” which is led by Akvaplan-niva in Tromso and financed by the Research Council of Norway’s DEMO2000 programme and ConocoPhillips Norway.